In most comic book universes, like the Earth of Freedom City and Emerald City, humanity is not alone in the cosmos, far from it, in fact. Any number of alien civilizations have contact with Earth, ranging from the lone survivors of long-lost worlds and peaceful explorers to invading empires, marauding warlords, or inhuman horrors. Each of these alien species has its own technology, used to further its purposes, and often so advanced as to appear like just another super-power to the inhabitants of a world of costumed heroes and villains. 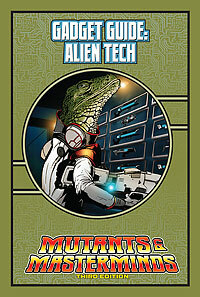 Alien Tech looks at technology and devices commonly used by aliens, and how to include them in your M&M series.